The self-skin polyurethane seat construction allows for rigorous use in most any environment. 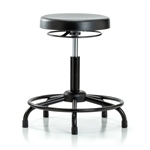 This line of polyurethane laboratory stools features the 360° adjustment ring, a 24" base and 13.5" diameter seat upholding exacting standards great quality, functionality, and design. Find a wide selection of lab stools for sale with Source Medical Equipment!